I have been humbled and excited to make a month’s journey thinking about civility. It’s been a great ride, intellectually and relationally, as we interacted on Twitter, Facebook and here! Thank you! Let’s live the dream! Let’s speak a world of bridges into reality where the spaces between us afford some beautiful views and vistas where only disconnect had been seen before! This entry was posted in October 2012 Civility and tagged bridges, Civility, Dream. Around eight days ago I had a bunch of words and a couple of ideas. Today the dream has a name, a website domain, a twitter account, a three page organizational document, offers for videography/photography and web hosting services, contacts with established nonprofits, four committed, way talented and wonderful board members, a lead on a friendly lawyer who is knowledgeable in helping establish nonprofits legally, and finally our document is being reviewed for free by a professional grant writer… GOD IS TRIPPING MY FUSES! How many times have any of us wanted to wake from a dream and find it to be our reality? I am awed and humbled by what is happening in the hearts of people and by the ease of making things happen with this little dream. I don’t want to be unthoughtful in my words or less than totally sincere. I am freaking out! And it all makes me very aware of the need for some gratefulness. St. Ignatius of Loyola said that he figured, “The root of all sins is ingratitude.” Word. So, this is where we have come in a very short time… but so much remains to be done before we ever put the needed antiretroviral medicines in an individual’s hands! In fact, this is crunch time for me. The need for me to do paperwork is terrifying. Paperwork is my worst allergy. The temptation to slow down, rein in and be “common sensical” is overwhelming. But the thing is out of the bag and running and I will not quench it. So pray with me, please. Go to gratefulness.org and light a virtual candle in thanks, praise and humbled request for all God has done, is doing and will do with us! And for all those wondering, the full name is Envision HIV/AIDS Relief in Africa, or Envision for short. The domain is EnvisionAfrica.org, though there’s nothing there yet. The Twitter is @EnvisionAfrica. This entry was posted in Africa, HIV/AIDS, Just Life, Prayer, Social Justice and tagged Africa, Dream, Gratefulness, HIV/AIDS, Update. 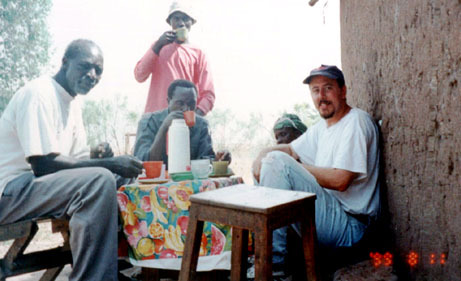 When I lived in Kenya back in 1989 and 1990 I was aware of the HIV/AIDS problem in Sub-Saharan Africa in an intellectual way, but not an intimate way. It was not something I saw among the Giryama people, but only caught glimpses of in the haunted eyes of coastal prostitutes who shuffled the streets of Malindi and Mombasa. When my family lived and worked in Tanzania some years later I was introduced to the problem in far more personal ways. I was often asked to drive someone in from the rural areas to the urban hospital, usually to die. They would be suffering from the multiple, debilitating diseases that often afflict poor souls in the last stages of their body’s battle with AIDS. I was asked to drive for a couple of funerals, including the funeral of a good friend’s aunt who died from AIDS related diseases. She was first person with whom I sat holding hands and praying in those final, painful days. It took some years to process these experiences. I have rarely spoken of them. Really, it was almost five years later when sitting in a coffee shop back Stateside (as I am at this moment) that I thought, “Why have I not talked more about this? Why have I not wept more for this? Why have I not done anything about this?” And a dream began taking shape in my heart and mind for a way to respond to the HIV/AIDS pandemic in Sub-Saharan Africa. This thought also rolled into view about the same time something else really clicked for me for the first time… it’s this… Have you ever realized the untapped potential for global change buried in the wealth of Western Christianity? I know that money is not the blanket panacea for all our planet’s woes, but stop and think about it for a moment. I know we as Christians give a lot of money locally and globally… but also stop and think about how much we have left over after that giving! Do we have enough to really break into the cycle of disease and poverty in regions like Sub-Saharan Africa? I began to suspect that we do, especially as I took a look at the discretionary spending going on in the life at that time of this “poor” in-between-jobs-at-the-time pastor (me). And we won’t mention the discretionary spending I waste these days as a currently employed pastor, for the shame of it. I started reading and looking around and discovered that it cost only about a $1 a day to supply the needed antiretroviral medicines to an infected person in Sub-Saharan Africa, and I’ve lately read that the cost has dropped to only $88 annual! My beloved people, that’s chump change to us, but an unreachable goal for the vast majority of these infected neighbors of ours who are trying to hold families together, maybe accomplish year-round subsistence farming, keep kids in school and often have to walk miles a day with their associated secondary diseases just to fetch clean water. And here’s the big “Why?” Why do this? We should know that HIV/AIDS is not just a health issue, but also a social issue and a family issue, a parental issue, child issue and a poverty issue. A steady available supply of antiretroviral medicine will keep countless individuals alive, and saving lives is result enough. But it gets better! When we help save a mother or a father from from an early AIDS related death, we can help keep a family intact. We can give the gift of having parents back to a potential orphan! We enable a mother and/or a father to keep working and thereby support their family. This serves a family unit and helps keep a local economy moving! And whole family units are better equipped to survive and thrive in ways like sending their children to school instead of needing them in the fields all day. We can have an educational impact! And when an infected mother is on a regimen of antiretroviral medicine the rate of transmission of the HIV virus to her child at birth is drastically reduced. We can have an impact on transmission rates! Did you follow all that? Potentially, for $88 dollars a year per God-created-and-loved, precious human soul, any one of us or all of us can help keep people stay alive, help keep families together, help have a positive impact on poverty and local economies, and help cut HIV transmission rates! This is a response with a near total impact on the spectrum of problems connected to HIV/AIDS in Sub-Saharan Africa! I believe that the heart of God beats in this kind of vision, but I’m terrified, excited and overwhelmed every time I speak it. I am weak, and I am an individual. There are other issues surrounding HIV/AIDS in Africa, and I not ignorant of them. I have first-hand seen and know how a lack of education contributes to the spread of HIV. I have seen first-hand and know how rampant sexually activity, sometimes even aided by cultural or religious norms, has contributed to the spread of HIV. I don’t dismiss those issues, but countless programs are addressing them, and neither issue causes me a moment’s pause in wanting to help people stay alive, to keep families together, to help parents keep working, to enable children to get an education, or to help cut HIV transmission rates to children at birth. As thrilled and humbled as I am each time I stop my usual business and think on these things, I am equally baffled at what to do next or if to do anything at all. So I sincerely ask you for help. What should I do? What are your thoughts? You who know me… Where should I turn or go, or what should I do next? Do I give our God a vow and a plea to make this happen and then start working on the realities of it? Thank you, for any thoughts, prayers and consideration you can give me with these questions. This entry was posted in Just Life and tagged Africa, Dream, HIV/AIDS, NonProfit, Vision.